The Etihad Stadium, also known as Eastlands, was built for the 2002 Commonwealth Games. After the Games, it was converted for use as a football ground and a further 10,000 seats were added to turn it into a very impressive stadium. The stadium is bowl-shaped, with two tiers all the way around the ground and a third tier along the two side stands whilst offering unobstructed views from every seat. In 2015 an extra tier was added to the South Stand behind one of the goals increasing capacity to over 55,000. 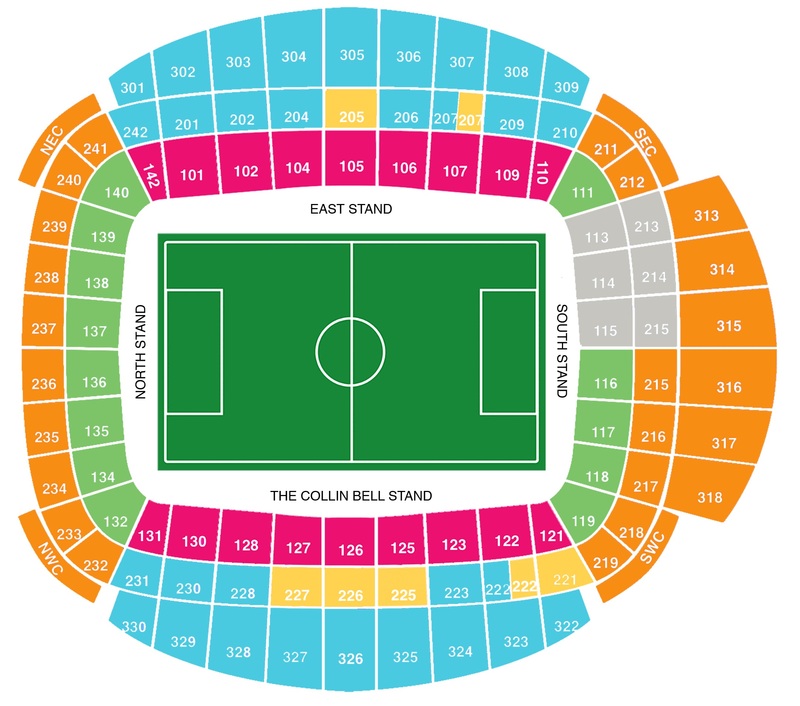 Up to 3,000 away fans are allocated one side of the upper, middle and lower tiers of the South Stand behind one of the goals. This can be increased for cup games if there's enough demand. As you would expect for such a new stadium, the view from all stands is unobstructed but be aware that leg room is a little less friendly for people over 6'0. Facilities are excellent and there's a fair range of food and drink available. There aren't too many places to drink around the ground, most fans preferring to drink in the centre of Manchester before making the short walk to the stadium. Of the pubs within the vicinity, the Stanley sports bar which is about 10 minutes walk away from the stadium does allow a small number of away fans in. It is just set back from the main A6010, going towards Ashburys train station. Children are also allowed. There is a small amount of parking available at the stadium which costs £5 per car. The East Car Park is nearest to the away entrance. Street parking is possible but be aware that there is a residents only parking scheme in place in the immediate roads around the ground, and this extends to approximately a mile out from the stadium. Therefore, it means parking further away and then walking to the stadium. Some 'football' car parks have emerged in the local areas charging between £4 and £6 per car. The nearest / closest train stations to Manchester City's Etihad Stadium are Manchester Piccadilly and Manchester Victoria. Both are approximately a 20 to 30 minute walk away. Ashburys is a smaller station situated to the south on Alan Turing Way and is a 15 minute walk to the stadium. Travel: I travelled by car. There are plenty of car parks near the ground. Refreshments: There are some local pubs in area that will let away fans in, unless you are UTD. There is plenty of eating bars. Impressions: Looks exactly what it is. A new and well built ground. Inside there is plenty of good bars for food & drink. Has a brilliant atmosphere. Facilities: Excellent, with ample leg room. Exit: Do not head toward the Town Centre or around ground, drive in the opposite direction as it's murder. Enjoy: Its always nice to go but its getting too dear for the working man. It is at least worth the visit once. Travel: Got the coach the first time, drove all the others. It's fairly straightforward, just following the A57 from the motorway. If you head towards Pottery Road, there are a couple of car parks there which aren't bad for getting away and are quite safe. Refreshments: First couple of visits, I wasn't impressed. The pubs next to the ground don't allow in away fans, the chippy nearest the ground was horrible, and to make it worse the day of the infamous 11.15am kick off, we ended up having breakfast in the most vile disgusting cafe I think I've ever been in… no exaggeration, I was constantly reminded of the woman in the sweet shop in Roald Dahl’s Boy! A steward helpfully pointed us in the direction of a decent pub 2 seasons ago though and it's been a better away day since, called Champagne Charlie’s just off the main road as you head down Alan Turing Way. We were late arriving at the game in 2010 so didn't have time to stop, but it looked like this place had shut which is a shame. Impressions: Underneath the stand, it's by far the best planned of all the new grounds. Massive, plenty of space for queues without any unnecessary congestion and decent choice of food. In the seats, perfect view from every seat, what more do you need? Atmosphere: It varies. My first away game was here and I thought it was brilliant. However my next two visits were a 11.15am kick off and New Year’s Day…both were absolutely dire from both sets of fans. We won on the next three visits so the atmosphere from us was stunning and non existent from them. Unfortunately when we visit, the whole manc/scouse thing always rears it’s ugly head, since on all four visits where we have won, we've had to put up with having stuff thrown at us after the game, which is nice of them! Enjoy: Facilities-wise, it is one of the best around. Not exactly the most welcoming place in the world for us though and as above, edible food is hard to come by! Have you been to see a game at Manchester City's Etihad Stadium? To tell us about your experiences and to feature on the site, simply complete the fans review form below!